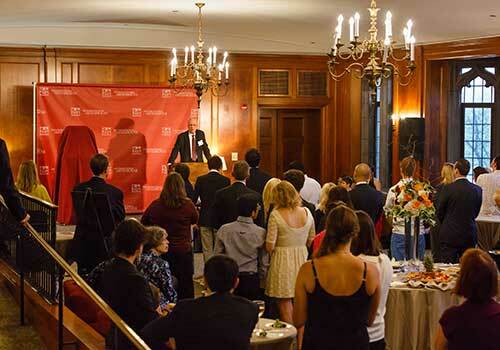 On June 1, 2013 International House dedicated its main lounge as the Rockefeller Lounge, in recognition of the Rockefeller family’s long support of I-House, including David Rockefeller’s (PhD’40) support of recent renovations. The ceremony also marked the conclusion of the year-long 80th anniversary celebration of International House at the University of Chicago. Ralph W. Nicholas, AM’58, PhD’62, William Rainey Harper Professor Emeritus of Anthropology and of Social Sciences in the College and former International House Director, offered remarks at the Rockefeller Lounge Dedication.